Chrysocholla Peru. 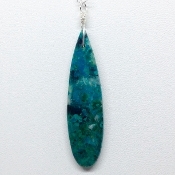 Center stone: 46mm x 12mm x 4mm, 925 silver chain adjustable to 18'. 17", 16". Shown far right in picture with all 3. Also has some gem silica in quartz (from the turqoise).